Welcome to the Marked Birds Database: a system that I have set up as a personal project for keeping track of any ringed birds that I observe. 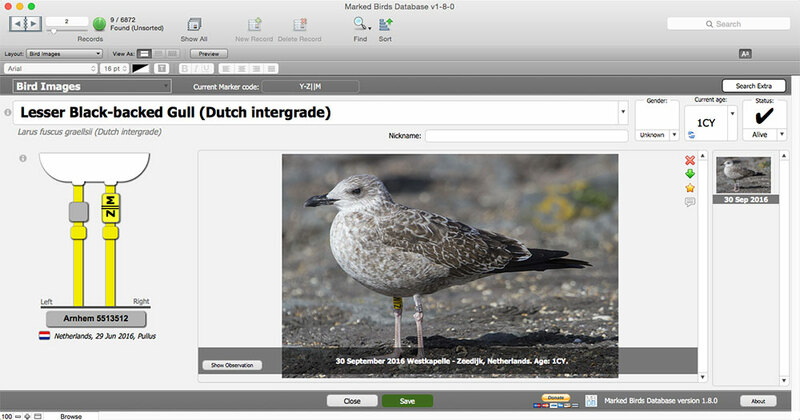 Because I have a passion for gulls and am based in the Netherlands, it is mainly designed around gull projects in Europe. However, it can also be used for other species and projects. In this blog post I will give a brief overview of what the database is and what you can (and cannot) do with it. 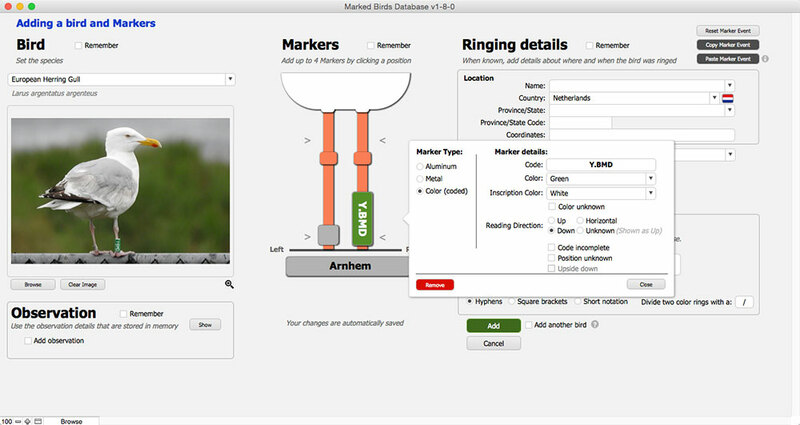 In short, the database allows you to keep track of birds that are fitted with a marker: a leg ring, collar ring, wing tag or nasal saddle. You can keep track of markers that are currently fitted to the bird as well as those that the bird used to have fitted in the past. What I think is unique about database is that it has been set up from the perspective of an observer, meaning that you can keep track of any bird of any project. 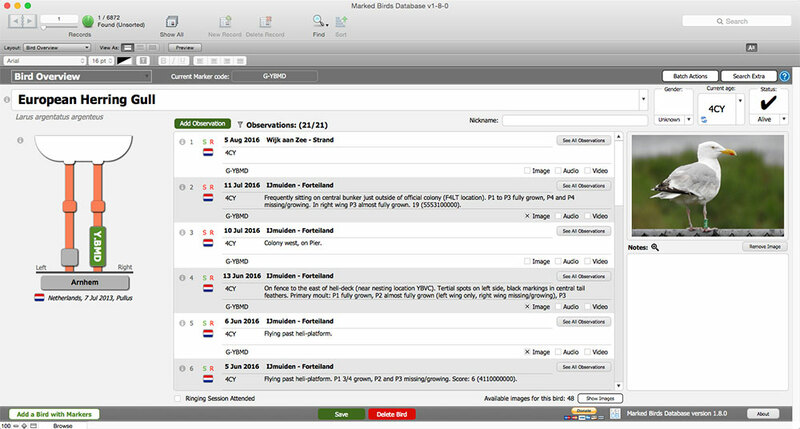 As a result, you will have all your observations in one central place. 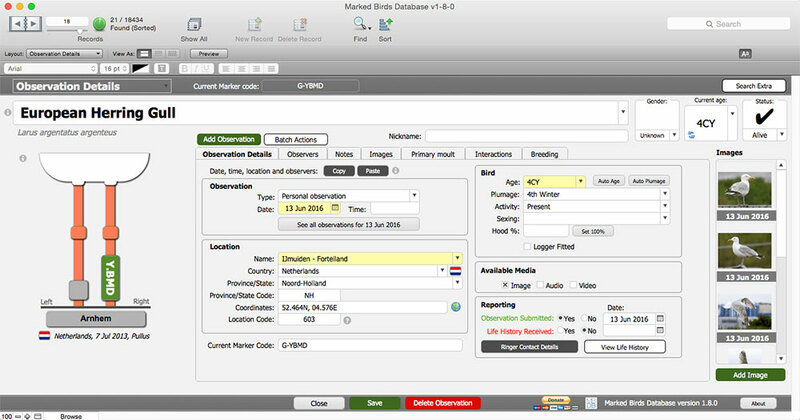 This then allows you to search for all birds that you have seen, for example by species, location, project or any combination thereof. Of course you still need to submit your observations and the database helps you manage that as well: it allows you to keep track of the observations that you have sent out or still need to send out, as well as keeping track of those observations for which you are still waiting on a reply. 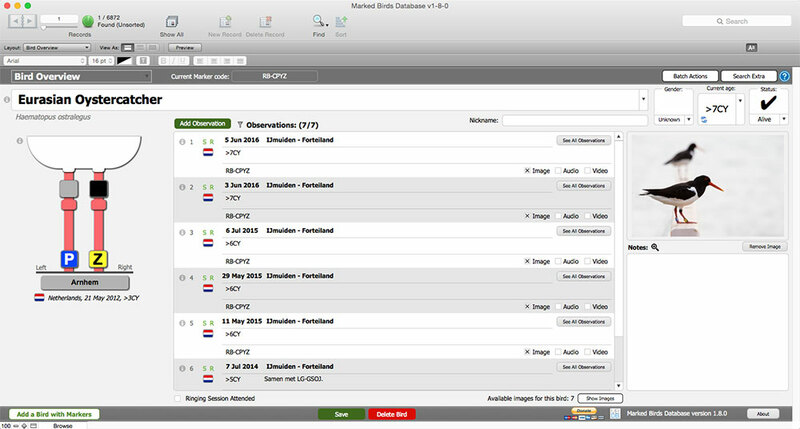 It is also possible to export observations to Excel for sending them out easily. As mentioned, I mainly observe gulls which are pretty much always fitted with leg rings. I like to keep track of each ring that a gull is fitted with, including position, ring color, inscription color and reading direction. By using different forms I have tried to make entering these rings to a bird as simple and efficient as possible. 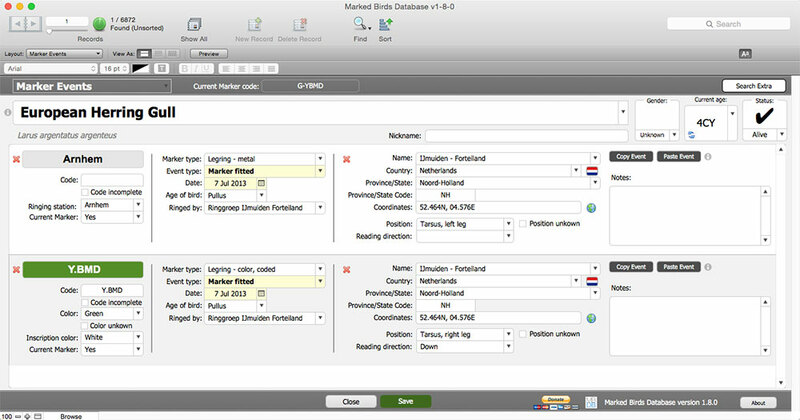 I have also created similar forms for quickly entering Eurasian Oystercatchers that belong to Dutch projects. Entering species other than gulls (or Dutch Oystercatchers) is also possible but might be less efficient. 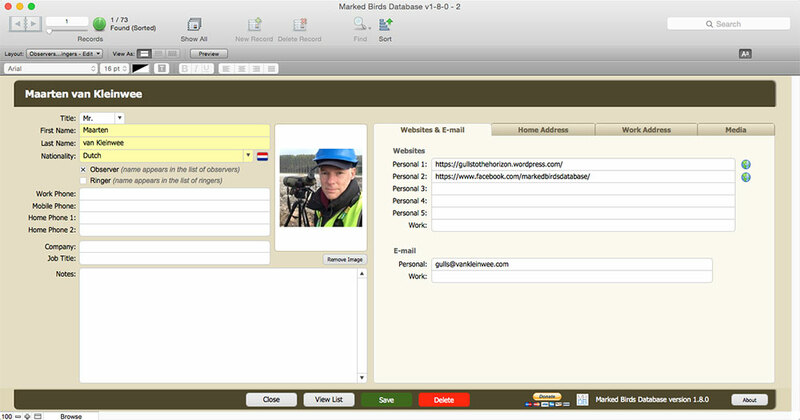 Note that it is not possible to keep track of wader projects which make use of multiple rings and flags; may aim is to add support for these projects in an upcoming version. One other nice feature of the database is that leg rings are displayed in the way they are fitted. Not only does this look nice and reminds you of what the rings looked like when you saw the bird, but it also acts as an extra check to see if you have written down or entered the ringing details correctly. 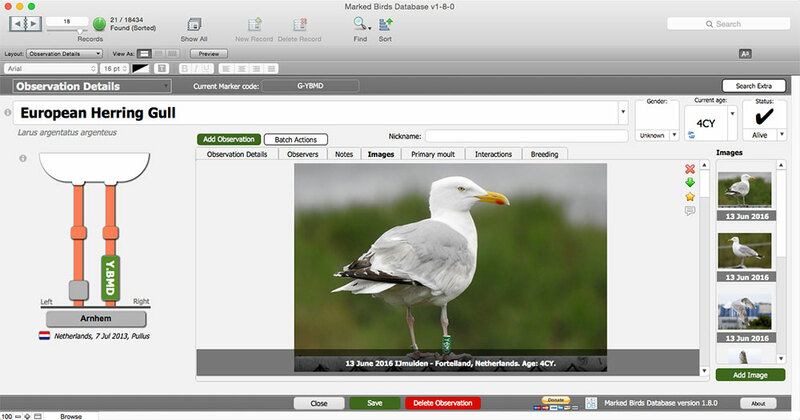 But in short, the database mainly revolves around birds with their observations, ringing details and life histories. It also automatically calculates the age of a bird (in calendar years) so that you never have to calculate this yourself. 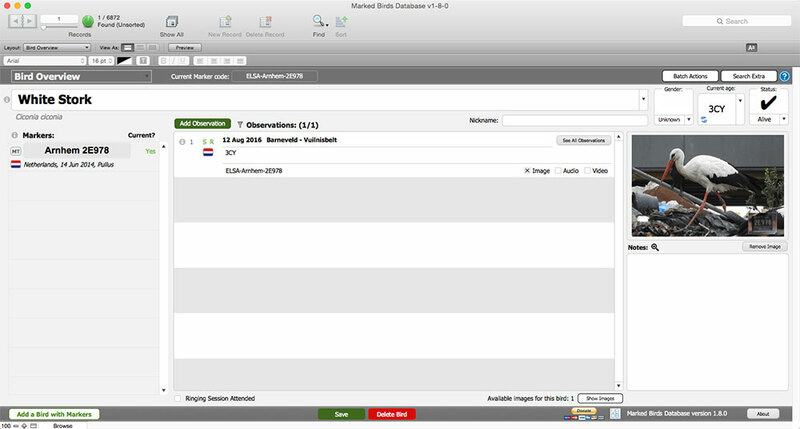 Finally: keep in mind that I have created this database purely as a personal and private project which I am sharing with the birding community because I recognise that other ring readers (or even ringers) could benefit from using it. So it may not have all features that you require, connect to the systems you want to connect to, or work in the way you want to. Nevertheless I hope you can make use of it and enjoy working with it. 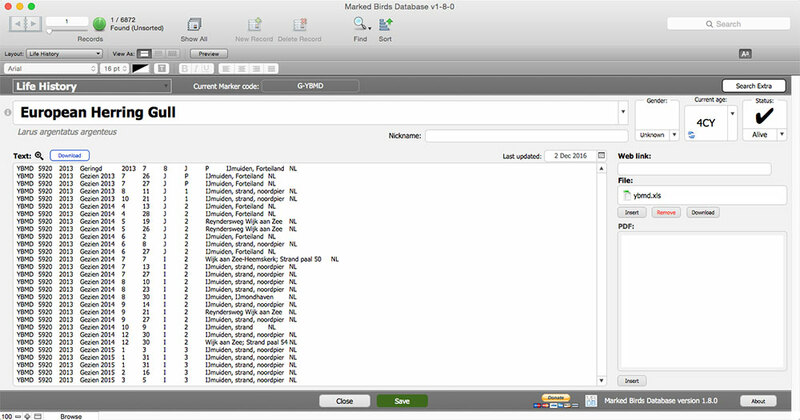 Note: the video shows a relatively old version of the database; however, the principle is the same.